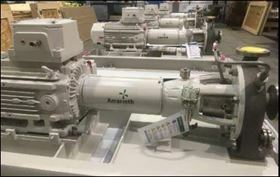 Amarinth titanium pumps destined for ADMA-OPCO, Abu Dhabi. Cumberland approached Amarinth to tender for the pumps on a tight 24 week delivery. To minimise corrosion from the sodium hypochlorite, Amarinth proposed using titanium alloy for all wetted parts, including the casing, impeller and shaft. Amarinth was able to source the titanium required through its supply chain and then worked closely with its foundry in Sheffield, UK, casting the components. The four titanium pumps have now been successfully manufactured and assembled and will be commissioned on the offshore Umm Lulu platform during the first half of 2016. The Umm Lulu field is located in the Arabian Gulf, 30km north-west of Abu Dhabi, in the United Arab Emirates. It is being developed as part of a strategic initiative to pump 1.75 million barrels of crude per day by 2017, increasing Abu Dhabi's total crude oil production to 3.5 million barrels per day.